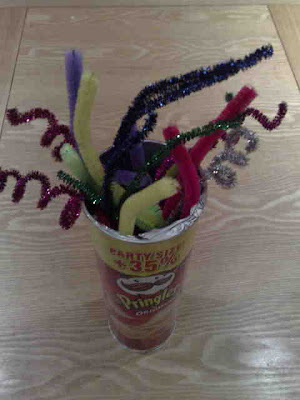 The Rubbish Diet: After the Party: Recycling Pringles et al. You've heard the phrase. "Once you pop, you can't stop". But when you actually do stop because you've run out of Pringles and the party's over, what should you do with the empty can, and other cans like it? Until now, I've just been bunging the can into the recycling bin, without any additional thought. After all the packaging has a little symbol on it, which looks lovely and environmentally friendly. It looks like a "Please Recycle Me" symbol doesn't it? All environmentally friendly consumers, be warned. According to WasteOnline, this symbol, which is called the Green Dot, simply means that the manufacturer has paid a contribution towards the packaging recovery system in GERMANY! It's got nothing to do with recycling potential at all! Now that makes me feel like a real Dummkopf. Please tell me that I am not the only person in the UK who has misunderstood this lovely looking symbol of environmental integrity. Take a good look at the packaging in your house and let me know what you think. However, I really hate to be thwarted, so whilst admiring the Packasaurus Ex at the Press Launch the other day, I thought I'd check with the lovely Kate of St Edmundsbury's Waste Team, whether it is possible to recycle Pringles cans. Much to my relief she said yes. Pringles cans may be recycled at our local Materals Recycling Facility (MRF). However, there is a technique and you can't just bung them in the bin as I've been doing for years. To make Pringles cans recyclable, the trick is to separate the metal bottom and the plastic lid and throw them in the bin separately. This is so the cardboard component can be easily added to the card at the MRF. This is great news especially when you think that this product is the UK's number 1 snack, particularly at Christmas, and comes in at number 32 in the Nielson Top 100 Grocery Brands list. That would be a lot of pringles being sent to landfill if recycling facilities aren't available. However, it does appear that facilities aren't available everywhere. Apparently we are lucky in Suffolk, where products like this can be processed effectively. I would love to know what your local facilities are like. Any feedback in the comments would be very interesting indeed. If you find that they can't be recycled in your area, the only answer for keeping them out of landfill is to send them to the school for junk modelling or try one of the ideas from the site shown below. I only just came across your blog the other day and I must say it's been really interesting reading about your 'waste free' journey. Yes, we had to look up the 'Green Dot' too, and discovered the Germany thing. It was quite frustrating as we'd also assumed it meant the package was recyclable. We're doing OK with our domestic waste, we compost and recycle, and also do our best to reuse and reduce! We threw out only one black bin bag for four weeks waste the other day, mainly due to forgetting to put it out each week! We're in Oxfordshire (Vale of the White Horse D.C.) and have kerbside collection of paper/glass/some plastics, and a brown bin for cardboard and garden waste. All the rest goes (is driven to) to the recycling centre in Oxford. Our biggest bugbear is polystyrene which apparantly has to go in landfill. I'm thinking the next step is a wormery and bukashi (sp?) bin. We're currently only two 'grown ups', however I'm going to find out in about 4 weeks how much difference another addition to the family can make...I won't be using 'disposable' nappies for sure! I'm Danda and I'm new in your blog even if I knew it just a month ago. I'm Italian. No, I'm not proud about what's happening in my country today, and I hope that people here really begin to consider the idea of being more responsible about waste, starting from this moment. I'm following your challenge step by step, trying to take examples from your lifestyle and, in a certain way, I'm doing my efforts to create less waste as possible (check my blog if you can - but sorry, the langauage is Italian!). With regard to this topic, I want to be thankful to you for clearing my doubt about the "green dot". Lots of time I was looking for an explanation around the web and finally I know thanks to you! I was disappointed too! I'm a graphic designer and I really didn't know the meaning of this symbol! I will discuss it on my blog in the future because unfortunately people ignore most of recycling symbols here! So thank you again! I will stay tuned! I'm stunned to learn that that symbol has nothing to do with recycling ... you're not the only one Mrs A.
Wow........ great blog article........ If you have think about party and worry about the party theme..... visit our site for your problem solutions. Hi Fi - Thanks for visiting and sharing your comments. You sound as though you're way ahead of me with our black bin waste. Fantastic. It also looks like you've got great recycling facilities and I agree polystyrene is hateful and in my opinion unnecessary. (I am sure the producers would disagree with me). I can recommend a Bokashi Bin. If you haven't already, take a look at the Food Waste links on my story so far for some motivation. It's been great. Well it looks like you will be busy soon with other things...and I'd like to wish you the very best with your "delivery". Keep popping by as it would be great to have your regular feedback. Hi Danda - thanks too for popping over from Italia and sharing your situation. I've read about the waste problem in Naples and if you have time, it would be great if you could share your own experience and take on the situation. It is quite scary what can actually happen if local collection services aren't available. I am glad the blog has been encouraging and that I've been able to share my findings along the way. Please keep coming back and in the meantime good luck with your own journey in Italy. Hello Bhuvan Chand - I think marketing your party theme, might be considered spamming, but I'll give you the benefit of the doubt because you did it very politely. Pringles cartons make good rainmakers (except I had to buy the Pringles especially to do this project as we don't typically buy them). Are you sure you can put the tube from a Pringles can in your recycling? Grrrrr! I'm tempted to open the can out and remove the inner lining myself! Just thought I'd post that we have found that the plastic tops neatly fit the little white china ramekins that we bought some chocolate puds in. Now we can keep the made up powdered mustard from drying out and neatly stack them in the fridge. Don't usually buy them though and always feel that we have to strip the aluminium off as well as top and bottom. While here - why do pharmaceutical companies feel that cardboard needs to be foil coated eg for toothpaste - too much packaging anyway!